Welcome to Mama Carries Kitchen! Why is Soy wax the preferred wax for scented candles? These candles are highly scented candles. Our clientele say that the scent is long lasting and room filling. *Superior Cold Throw- The wax will hold more scent. Because we can use more scent the candle has a better smell even without burning it. *Longer lasting - Soy wax burns cooler which means that you can enjoy your soy wax candle for generally 30-50% longer than a paraffin candle. *Supports American Farmers- state of Michigan in 2013. Buying Soy Wax, stimulates local economies by utilizing a natural, renewable resource. Local crops supporting local people. This is the primary reason why we are phasing out our paraffin wax supply. These candles support farmers instead of middle east oil companies. Once our supply of parafin is gone we will only produce soy wax products. *Cleaner burning - No toxins, carcinogens or pollutants which means it's less likely to trigger allergies. No petrol-carbon soot like you get from petroleum-based paraffin candles. Perfect for indoor use! *Safer - A lower temperature burn results in a “cooler” liquid wax. 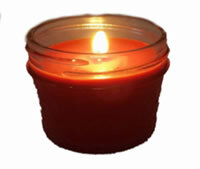 Accidental spills involving paraffin wax candles can lead to severe burns. The risk of severe burns is lower with soy wax. Click Here for available Scents and Ordering Information!